Did you know that Brown University has one of the oldest Ivy League engineering programs? Originally established in 1794 and located in Providence, RI, it is the seventh-oldest academic institution for higher education in the country. While Brown University has a strong legacy built on history and tradition, Brown University also looks towards the future, particularly in creating new educational opportunities for its students so they may learn, grow, and find solutions to some of the world’s most challenging issues. The Brown University School of Engineering’s Engineering Research Center is one such opportunity, and Ver-Tex is very proud to have been part of this exciting project! Ground was originally broken back in Fall 2015 and the building was completed in Fall 2017. The three-story, 80,000 sq. ft. space was built entirely from the ground up, featuring dedicated workstations for graduate students, cutting edge research labs, classrooms, conference rooms, and more. Shawmut Design & Construction served as General Contractor on the project and was designed by Philadelphia-based KieranTimberlake. Ver-Tex installed approximately (50) Hunter Douglas manual shades and (60) Lutron Sivoia QS motorized shades on this project. The motorized shades included the Hyperion automation system from Lutron. This solar-adapting shade software can adjust shades throughout the day with the changing position of the sun, allowing for energy savings and reducing both glare and heat. Hyperion includes automated raising and lowering of the shades, based on location and building orientation. The entire project adhered to the school’s Facility Design and Construction Standards and is built to fit LEED® Gold Certification. This certification means the building’s energy and performance goal is 25% better than the minimum criteria established in the Rhode Island-adopted International Energy Conservation Code. 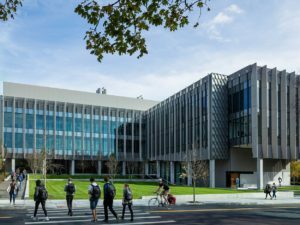 Upon completion, Brown University President Christina Paxson was quoted, “This building is a statement about the importance of engineering at Brown and also in the world at large.” It truly is an extraordinary space and we’re proud of the Ver-Tex team for doing such a fantastic job!